TV news magazine shows like Primetime, 48 Hours, and 20/20 have given us countless formulaic documentary-style depictions of murder and crime to the point that making a documentary feature film out of similar material seems almost pointless. And yet with INTO THE ABYSS, director Werner Herzog has proves that such stories that can be handled in a far more meaningful and profound way than we're used to. ABYSS focuses on a case that happened in 2001 in Conroe, Texas. We are told that Michael Perry and Jason Burkett (both 19 years old at the time) conned their way into a home in a gated community there and killed Sandra Stotler. Why? Because they wanted to steal the Camaro parked in her garage. Later, they killed the woman's 17 year old son Adam and his friend Jeremy Richardson as well, because after disposing of Stotler's body they needed someone's key to get back into the community and get the car. They then bragged about the killings and gave joyrides in the Camaro for a couple of days before being caught. It is the very definition of a senseless crime. Perry and Burkett are interviewed in depth, as are members of the victims' families, Jason Burkett's father (himself serving a lengthy prison sentence), a police officer involved in the case, the prison chaplain, and a man who for many years carried out executions in Texas until he finally felt he couldn't do his job any longer. Herzog asks very simple, direct, and often quite personal questions and then pulls back to listen. 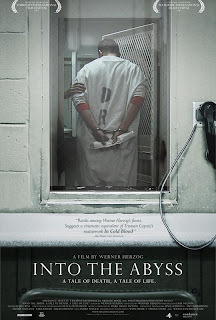 He's not going for sensationalism, and his subjects seem to understand that, responding with a thoughtfulness and degree of detail that makes INTO THE ABYSS far more than just another true crime film. This isn't a case where it's easy to feel sympathy for the convicted; each man lays the blame for the actual killings on the other, but we are given no reason to think anything other than both were willing participants in the murders. They may have been young when they committed these crimes, but one doesn't sense any real remorse from either. That removes the distraction of an innocent person possibly being put to death and forces us to ask ourselves if anyone, even someone almost certainly guilty of horrible crimes, should be executed. And given the differences in the sentencing of the two men, it also makes us think about why one (Burkett) gets to live while the other (Perry) must pay the ultimate price for the same crime. Herzog is upfront about his disapproval of the death penalty, and to some degree his film reflects that stance. But he seems less concerned with persuading his audience that execution is wrong than with getting them to genuinely think about the issue for themselves. In this post-Michael Moore era of blatantly politicized documentaries, it's rare to see one that really does its best to treat all sides of an issue with fairness and respect the way INTO THE ABYSS does. Regardless of where you stand on capitol punishment, this is a very real, very sad, and very powerful human story that can't help but affect you in some way. 4 out of 4 stars. I saw this today in an empty theater at Cedar Lee and thought it was one of the most agonizing and affecting movies I've seen. Happy you saw it, but really sad to hear the theater was empty. Why is it people complain that there aren't any good movies, yet when one comes along they stay away in droves? Meanwhile the horrible soulless corporate crap they claim they hate rakes in millions. Hope more folks show up for the evening shows. I couldn't agree with you more and I was going to write something similar in the introduction to my Best of 2011 column next week.